FIE Computerised Brinell Hardness Tester, Model B 3000-PC-FA is fabricators from steel plates and is designed for precise loading systems. It is fully automatic machine for production testing, Once the job is placed on testing table and a push button for operation cycle is pressed, the job is raised and swiveled and brought in contact with claming device. Then indentor is swivelled and brought in vertical loading position . 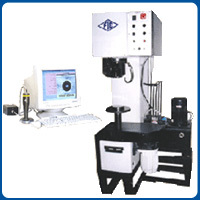 Full computerised (PC based) Brinell Hardness tester. Direct and accurate measurement Brinell hardness number using “ State of Art” image processing technology. Wide testing range: From soft metal such as lead up to hardest, like tempered steel. Advances image processing : Algorithms implemented for precise calculationsof hardness numbers with various options to cover all ranges of specimen. Batch file processing : Option for data / storage and reports generation. Statistical Evaluation : Software for calculating standard deviation, mean, medium,frequency distribution graph, variation graph etc. Extendibility for feature advanced image processing analysis, requirements. “ Auto measurement start “ from machine. Basic machine with CCD camera, optics with illumination systems and connecting cable. PC and windows operating system is to by produced by customer. Load range 250 to 3000 kgf in steps of 2580 kgf. Dwell timer 1 to 99 sec. Testing Table 200 mm 1 No. Testing Table 70 mm 1 No. Ball Holder 5 mm 1 No. Ball Holder 10 mm 1 No. Test block HB 5/750 1 No. Test block HB 10/3000 1 No.